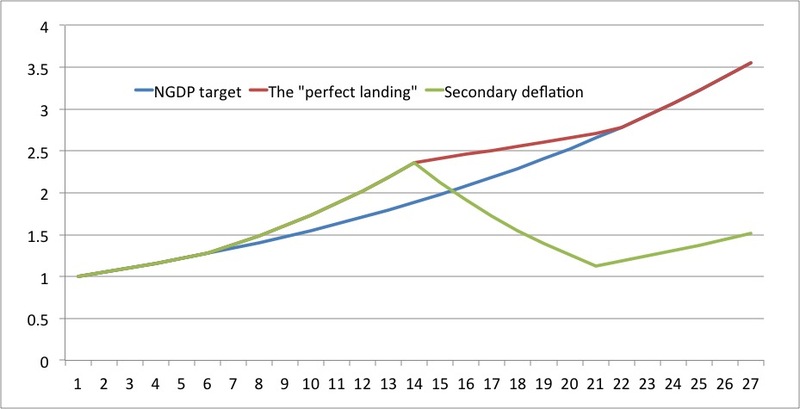 At least they are far enough away from the zero bound that David Glasner’s point about the Fisher Effect under deflationary expectations probably won’t bite them (and us). Lars, I have a question. So I would agree that montary policy that is done nicly would not creat bubbles or misalocation. Take a example of a free banking system with a gold base. If a gold flows into the system, the broad money expands, the diffrent banks spend this new money on whatever investment the think is best, witch probebly mean its spread threw the economy broadly. Now if the central bank only buys mortgage backed securities, would this not drive up the price and creat a misallocation of resources into sector? It seams to me if the central bank wants to do montary policy correctly they should invest into a wide range of industries in order not to influence the price (resource allocation) of any one industry to much. So it seams to me that moral hazzard, bad montary transmission and collective delusion can create bubbels. We can avoid the first two. Am I missunderstanding something? Do you agree? I agree with what you say on monetary policy. But, I think you grossly underestimate how hard it is for a corrupt state to allow its state-owned banks to foreclose on bad loans made to loss-making state-owned industries. In a democratic state failed economic policies of one government are usually exposed by the next government. I don’t see how this can happen in China. While the governing party has recently changed it’s leaders, the party in power has not changed. I recognise there is some sort of “clean up” taking place, but the hidden loan losses at the big state-owned banks are widely assumed to be very large. The message from the ultra-low PE ratios (c.5x) and P/BV ratios (c.0.5x) of the banks is very clear on this. The market is right, and is extremely sceptical. There must be a huge temptation to use monetary policy to inflate away the bad debts, rather than recognise and recapitalize the banks. Essentially, the route followed by China in 1998 was this policy. A 35% bad loans to total loans was recognised back then; the bad assets were “sold” to quasi-asset managers at more or less face value in return for bonds issued by the quasi-asset managers; the banks carried on more or less as before; and NGDP growth over the next ten years has gradually reduced the relative size of the old bad loans to a relatively small fraction of total loans. But banks as a % of GDP were far smaller than today, the same trick will cost far more today. Maybe it will work again, but maybe it won’t. The last ten years has seen strong, catch-up, RGDP growth as well as the strong NGDP growth. If the next few years are mostly NGDP and not RGDP growth, then how will the one party state cope with Brazil or Turkey style protests? Brazil and Turkey have proper elections and democratic accountability these days, and hopefully stick with those processes. What does China have? We’ll have to wait and see. James, I very much agree – Turkey-Brazil style demonstrations in China would send shock waves through the global financial markets and there is a major problem that most investors really don’t have a clue what is happening behind the scenes in China. It is easy to be bearish on the China outcome. China? Who understands China? State-contolled banks. But the CCP also controls the PBoC. 1.5 billion people. I assume it is an impossible country to understand–especially since you have experts making opposite predictions as to that nation’s future. I wonder if central banker-itis is even stronger than ideology. Central bankers should not be allowed to work at central banks. Benjamin. You are probably right. We’re doomed! The Chinese have actually had “easy money” for several years, in terms of negative real interest rates and high, probably too high, NGDP growth. The state control of banks then became even more necessary to ration credit growth attracted to the negative real interest rates via loan quotas and caps on deposit rates. However, the market response is to get round these constraints somehow. The consequence has been the explosive growth of “shadow banking”. I am now thinking that shadow banking in China is more of a “free-market/black market” response to excessive state control of official banking. It’s tolerated most of the time out of necessity, otherwise the overall economy won’t work. This has been the history of China since the end of Mao: small reforms through which the dynamism of the market then drives a bus right through. It’s not ideal, but it has clearly worked. The current vogue in China is to “teach these shadow banks” and the state banks that partly finance them, “a lesson”. The PBOC tigthening of liquidity is the result. Monetary policy has been abused once in staying too easy, resulting in huge banking sector distortions, and is now abused again. Freeing up state-owned banking from state-directed lending is the right thing to do, but politically very difficult, and economically painful for all those un-creditworthy state-owned enterprises, probably linked to senior politicians and their clans. I have no intention to gloss over China’s problems, particularly not those related to moral hazard dynamics, or the inefficiencies and problems resulting from the command-economy type structure. Nevertheless, it is worth noting that China has had several similar credit crunches since 2010. These crunches all led to temporary surges in money market rates, and a somewhat elevated, and more volatile, level of interbank rates there. However, these occurrences were all defused at least in the sense that they did not cause much damage outside the Chinese markets and Hong Kong. Countries in possession of the entire monetary policy arsenal of tools should be able to offset tighter conditions in China, which are apparently desired by the authorities there, as long as China’s economy doesn’t completely crash (which I don’t expect). Today, however, the markets obviously share your shares about a “secondary deflation” in China. I certainly hope that your are right and I am aware that we have had a couple of hiccups in the Chinese money market since monetary tightening was initiated in early 2010. However, the recent “event” has been much worsen than the other hiccups and it is particularly concerning that what we saw last week was at least the outcome of a deliberate attempt on part of PBoC to punish a certain part of the financial sector. Just had a horrible thought: What if the PBOC actions and the Fed actions are a coordinated move to suppress “bubbles”? James, that I don’t think, but it would truly be horrible even though BIS would it.